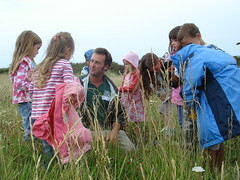 Durlston is famous for its wonderful wild flower meadows, but many have been established only relatively recently, using innovative management techniques. In 1982 the tenancy on the Durlston farmland ended and its management reverted to the Country Park. Repeated hay cutting and removal was carried out over several years to reduce the fertility of the soil. In other meadows the ground was ploughed up. Volunteers then collected seeds from the existing hay meadows and the new meadows were sown with a carefully selected seed mix. The project has exceeded all expectations: Bee and Pyramidal Orchids, Dyers Greenweed, Cowslip, Yellow Vetchling and Slender Tare are among the 100 or so wild flowers which are now established. Invertebrates have also colonised these habitats, with important colonies of Brown Argus and Small Blue butterflies, and the 6-spot Burnet Moth. In 1990 an English Nature survey of recreated meadows described Durlston's as 'among the best in Britain'. These habitats are considered worthy of SSSI status and are included in the Park's National Nature Reserve designation. The abundance of flowers and grasses found in hay meadows can be traced back to the woodland glades and floodplains of Ancient Britain. At this time most of the land was covered in thick forest and humans were hunter-gatherers moving from place to place. As people started to settle they cleared the trees and began farming these wild grasses. By the 11th century hay meadows had become commonplace - part of a traditional way of life. The Domesday Book records hay meadows in 8 out of 10 settlements. By the 17th century, after the Enclosures Act, much of the land was divided with dry stone walls and field boundaries. Hay meadows provided colour in the mosaic of field patterns that we still see today. As remnants of a farming system that is rapidly being lost, hay meadows form part of our cultural heritage. They inspire romantic images of rural life and have been celebrated in folklore, local traditions and literature. Hay meadows make an important contribution to the Durlston landscape. The rich tapestry of plants and changing colours throughout the year provide a spectacular display. 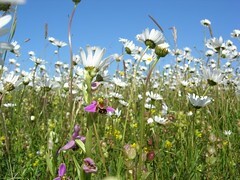 Hay meadows can support an amazing 50 plant species per square metre. This diversity of plants, with many species coexisting in a small area, has developed over a long period of time and is partly the result of the different rates of growth and development of each species in the meadow. Nationally, 97% of flower-rich hay meadows were lost between the 1930s and the mid 1980s. This was due to agricultural intensification after the Second World War, with large areas of land being 'improved' to generate crops, and more recently to produce silage as winter feed for livestock. 'Improved grassland' is the term used to describe fields which have been ploughed and reseeded with fast growing grass species. These grasses then outgrow or 'out compete' the wild flowers. Chemical fertilisers are applied to encourage growth or 'productivity', but often this kills off the wild flowers which find the improved soils too rich in nutrients to survive. Create a small hay meadow area in your own garden. Hay meadow seed mixes can be purchased at your local garden centre or online*. Maintenance is simple - it only requires cutting once a year in late summer. Encourage your friends and neighbours to do the same. By creating these small pockets of meadow habitat you help to provide wildlife corridors linking sites together and this helps animals to survive by providing them with a larger habitat resource. Buy products that are sourced from hay meadows such as certain toiletries, honey and medicines. Your support helps to ensure the survival of farmers who manage hay meadows. *Important: When buying meadow seed make sure it has been harvested in Britain. Sources: Peak District National Park; Durlston Management Plan 2005-10; The History of the Countryside, Oliver Rackham. Credits: Design, build, photos and video: Dom Greves. Flash scripting: Brian Dorey. Additional photography: Heather Bell, Edward Parker.